Once upon a time, long ago and far away (or perhaps not so long ago), teachers did not use fancy PowerPoint presentations, overhead projectors, or even chalkboards. They simply shared their knowledge through stories. Think back over your years of sitting in classrooms. What are the moments that you most remember? For me, one of those moments was my professor in introduction to psychology spinning the tale of Rosenhan’s pseudopatients, perfectly sane individuals who checked into a mental institution and proceeded to act in normal ways. It seemed like an amazing adventure – what was going to happen to these people in the mental hospital? The class was hanging on his every word. The odds are that your memorable moments, too, have to do with stories – not theories or definitions or dates, but an unfolding narrative, complete with suspense, drama, or humor, or perhaps a personal anecdote shared by a favorite teacher. Of course, a classroom narrative may be linked to a major discovery, study, or figure in psychology, but it is not always the importance of the discovery alone that allows it to stay fresh over the years. Rather, the means of presenting the information can make it exciting and unforgettable. The power of stories has been recognized for centuries, and even today, in Hollywood and beyond, storytelling is a multi-million dollar business. Stories are a natural mode of thinking; before our formal education begins, we are already learning from Aesop’s fables, fairy tales, or family history. Indeed, some researchers have even claimed that all knowledge comes in the form of stories (Schank & Abelson, 1995)! Although this strong claim has been questioned, it is generally agreed that stories are a powerful structure for organizing and transmitting information, and for creating meaning in our lives and environments. What is a story? In essence, a narrative account requires a story that raises unanswered questions or unresolved conflicts; characters may encounter and then resolve a crisis or crises. A story line, with a beginning, middle and end, is identifiable. In Bruner’s (1986) words, “[Narrative] deals in human or human-like intention and action and the vicissitudes and consequences that mark their course. It strives to put its timeless miracles into the particulars of experience and to locate the experience in time and place.” Stories can bring abstract principles to life by giving them concrete form. We cannot always give students direct experience with psychological concepts, but stories might come close. A story tends to have more depth than a simple example. A story tells about some event – some particular individuals, and something that happens to them. Stories engage our thinking, our emotions, and can even lead to the creation of mental imagery (Green & Brock, 2000). Individuals listening to stories react to them almost automatically, participating, in a sense, in the action of the narrative (e.g., Polichak & Gerrig, 2002). Bringing all of these systems to bear on the material in your course helps student learning. Students are awake, following along, wanting to find out what happens next and how the story ends. Bruner (1986) has contrasted the paradigmatic (logical, scientific) and narrative modes of thinking, but these modes need not be mutually exclusive in the classroom. Stories can serve multiple functions in the classroom, including sparking student interest, aiding the flow of lectures, making material memorable, overcoming student resistance or anxiety, and building rapport between the instructor and the students, or among students themselves. As an instructor, you can capitalize on the inherent narrative structure of research as the quest for knowledge. 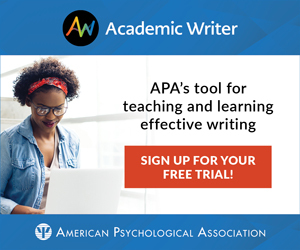 Science is the process of solving mysteries; in fact, writers of journal articles are often advised to make their findings into “a good story.” Psychologists often start out by confronting an intriguing problem. For example, why are bicycle riders faster when they are racing against another person than going around the track by themselves? Researchers also encounter and overcome various obstacles in their quest to understand a phenomenon. For example, when researchers tried to replicate social facilitation effects, sometimes the presence of others improved performance, and other times it harmed performance. Why would that be? Take advantage of the suspense that this chain of events can create. Telling the story of how researchers became interested in a particular issue, without immediately providing the resolution, will motivate your class to think of their own approaches to solving the problem. They can share in the sense of discovery. Understanding the process of solving a research problem can generate excitement, as well as an increased appreciation for the “detective work” involved in psychology. Characters are an important element of any tale, and indeed, stories can also make material concrete and memorable by putting a human (or animal) face on theories and issues. Students may remember the peril of H. M., the patient who could not form new memories, long after they have forgotten other details of brain anatomy or memory research. They may have a vivid mental image of Harry Harlow’s orphaned monkeys interacting with cloth or wire “mothers.” If they remember the concrete elements of the story, they may then be able to reconstruct the abstract lessons illustrated by the story. Furthermore, listeners may identify with the protagonists of your stories, and thus might be better able to relate course material to their own lives. Making the material personally relevant can lead to increased thinking about the material and a greater ability to apply the new knowledge. Similarly, giving some background about the researchers who developed particular theories can help engage student interest by humanizing the research process, and may even provide role models for students who may be interested in pursing research themselves. (This approach can be used to excellent effect in history of psychology courses.) Stories can convey the passion, enthusiasm, and curiosity of the researchers. Sometimes psychological research can seem divorced from the real world, but in the process of developing his theories about compliance, Cialdini actually went through training programs to becomes a salesman of encyclopedias, dance lessons, and the like. He also went “on the inside” as a particiapnt-observer to study advertising, public relations, and fundraising agencies to learn about their techniques. Students studying social influence love to hear about Cialdini immersing himself in the world of compliance professionals. Coherence is the hallmark of a good narrative. Remembering a list of isolated concepts and definitions is difficult, but recalling the flow of a research story may be easier for students. As mentioned above, stories may also help create vivid mental images, another cue for recall. Because stories provide natural connections between events and concepts, mentioning one part of the story may help evoke the other parts of the story, just as hearing one bar of a familiar tune may bring the entire song to mind. This rapport can lead to a positive classroom climate. Perhaps you are a clinical psychologist who has seen a patient with a particularly compelling presentation of the disorder you’re discussing in class. Or maybe you’re a social psychologist who has had your own brush with bystander intervention and diffusion of responsibility. Sharing these experiences gives the class a new tone, and makes the subject come alive. As long as every class session isn’t another chapter from your autobiography, students enjoy seeing a glimpse of the human side of their professors. As an added benefit, in discussion classes, providing this kind of opening may inspire reciprocity and help create an atmosphere where students are more willing to share their opinions and experiences. There are a wealth of sources for teachable stories – current events, history, television programs, classic literature or drama, and personal experience (your own and others). Some instructors find it useful to have a folder or notebook for teaching stories; make a habit of clipping relevant newspaper stories, or making notes about events that are perfect illustrations of some psychological concept that appears in your course. These don’t have to be current events to capture student interest: A colleague uses a scene from the book Killer Angels (Shaara, 1974), about the Battle of Gettysburg, to demonstrate the power of perception over reality. In the book, the Confederate General Longstreet is portrayed as sitting calmly before the battle. A foreign journalist infers that he is composing himself, thinking of strategy and so forth. In reality, he is weeping, knowing his men will die because he asks them to, knowing what the day will bring. And remember, research results need to be true, but stories do not. Do not be afraid to use stories from fiction, especially well-known fiction. For instance, the children’s story “The Emperor’s New Clothes” demonstrates social influence principles; the interactions between Iago, Othello, and Desdemona in Shakespeare’s play Othello provide a powerful illustration of the importance of perceptions over objective reality. Classic Studies in Psychology (Schwartz, 1986). Think about common experiences that your students have likely had – stories about leaving home, dealing with roommates, handling relationships, and the like may be especially relevant to a college-age audience. The case study method, frequently used in business schools, is a popular means of introducing stories into the classroom. Cases typically set up a problem by giving background information about a situation (for example, the history of a company), and end with a current dilemma faced by an individual or organization. They are often designed to illustrate a particular point or demonstrate certain analytic procedures. Students are encouraged to generate possible solutions and consider the consequences of those solutions. This method encourages active learning, and in essence, puts students in the role of writing the ending to the story. A related method (which can be more or less narrative in form) is role-playing, where students actively create or take part in a mini-drama in the classroom. McKeachie (1999) gives the example of students taking the perspective of Freud or Skinner in responding to a treatment situation. Role-playing is another means of merging the power of stories with the benefits of active learning. Stories may also be integrated with technology. You may be able to locate computer-based or interactive stories that relate to your course content. (If you are programming-savvy or have time on your hands, you may even be able to develop these kinds of applications.) Teaching Web sites can also be rich sources of stories. And you don’t always have to be the storyteller; films and Web sites may also be effective means of delivering psychology’s stories. The lecture itself may be structured as a narrative, or a story can simply be an illustration of a key point. Taking advantage of the natural drama of research stories can help the pacing and flow of your lectures. Imagine yourself as a storyteller, perhaps with your students gathered around a campfire. Rather than marching through the material, fact by fact, you can add storytelling flourishes. Let the suspense build – pause for a moment before revealing the results of the study, to draw in students’ attention. Stories can also be a natural way to introduce humor into your lecture. One way to learn about how to tell a story is to listen to master storytellers at work. National Public Radio provides some wonderful examples: Garrison Keillor, for instance, enthralls thousands of people each week with his tales of Lake Wobegon. You may also know people in your own life – relatives, friends, and colleagues – who can spin a marvelous tale. Take note of how they involve their audience, and use those techniques as you develop your own style. Do they pause at key places? What information do they give early on to draw listeners in, and how do they maintain suspense? Do they bring characters to life with vivid descriptions or unique voices? Just as you develop your own style of teaching, so too can you develop your own style of storytelling that draws on role models, but fits your own personality. As with any example, a story should be a clear illustration of the principle you’re trying to demonstrate. Because listeners have their own interpretations of the point of stories, it is your responsibility as an instructor to make the message of the story clear, and draw links between the story and the abstract principles it demonstrates. Beginning students, especially, may not be able to make these connections on their own, or they may remember peripheral aspects of the story rather than the main point. Students should be aware that classroom stories are part of the learning experience, not a tangent from it. Keep the story clean and to the point. Furthermore, if a story doesn’t quite match the concept you are trying to demonstrate, you may be better off omitting it. At exam time, students who remember a story from class should not be misled by its conclusions. When is the best time to tell a story for it to have the maximum impact? Schank (1990) suggest that stories should come after surprises, or expectation failures. When individuals have recognized flaws in their existing models of the world, they are open to correcting those models. Individuals are especially open to learning when the expectation failure and story are relevant to their goals. For example, suppose you had just come back from teaching a particularly frustrating day of class, where students’ minds were wandering and you couldn’t seem to engage the class. If at that moment, your colleague told you about how she had transformed her classroom environment by starting each lecture with a story that presented a real-world problem or mystery, and working through it over the course of the class session, you might be especially open to learning from that tale. For your students, framing stories with relevant problems (succeeding at a job, getting along with roommates) may help make them more likely to be attended to and recalled. Along the same lines, stories can be told from different points of view. Think about perspective when you’re designing your lecture. You could describe an experiment from the researcher’s point of view, but you might instead begin by telling the story of what a participant in that study experienced instead, to draw students into the situation. Imagine, for example, being a participant in the Asch conformity studies, with rising levels of confusion and doubt as your fellow participants continue to give wrong answers to a line judgment task. Stories can encourage empathy, and putting themselves in participants’ shoes can sometimes help students understand the power of experimental situations. Varying the presentation of research to focus on a researcher versus a participant perspective can also help add spice to your lectures. In some types of courses, particularly smaller seminars, it may be appropriate to have students share stories from their own lives, and indeed, students may spontaneously do this even in larger courses. This is another form of active learning, and students may be even more attentive to a story told by their peers. An instructor’s role might then be to link aspects of these narratives to theories or principles in the psychological literature. (Students may become frustrated with a course that appears to consist only of sharing individual experiences, without links to theory or research.) If individuals are likely to be sharing stories that may be sensitive – for example, struggles with psychological disorders, experiences with stereotyping or prejudice, – ground rules about respect for others, not discussing personal revelations outside the classroom, and the like should be established early. Can there be a downside to using stories in the classroom? One issue that psychology instructors sometimes face, especially in introductory and social psychology courses, is helping students to understand that personal experience isn’t everything, and that psychological questions can be tested scientifically and evaluated with data. Your use of stories should be integrated with reference to empirical evidence, so that students do not come away with the impression that a single story, even an especially vivid and compelling one, should be understood as proof for a particular position. You may also want to solicit student feedback on your stories, especially if you are telling a particular story for the first time, or if you are new at introducing storytelling into your teaching. You might ask students to list stories that they found to be interesting and useful, and alternatively, note whether any stories seemed to wander or create confusion. At the end of class or after telling a story, you might take a minute or so to ask students to summarize the point of a story you told, to make sure that your message has been conveyed. Stories can serve another function that goes beyond the classroom. Shared narrative can be a force in creating community. Stories tie current students to traditions and people from the past. If an important event or discovery took place on your campus or in your town, let students know about it. Tell stories that embody the values of your discipline and your campus. Share your teaching stories with colleagues. And may you and your students live happily ever after. Aronson, E. (1995). The social animal (7th ed.). New York: W. H. Freeman. Birren, J. E., & Schroots, J. J. F. (Eds.). (2000). A history of geropsychology in autobiography. Washington, DC: American Psychological Association. Brannigan, G.G., & Merrens, M.R. (1995). The social psychologists: Research adventures. New York: McGraw-Hill. Fancher, R. E. (1996). Pioneers of psychology (3rd ed.). New York: Norton. Green, M. C., & Brock, T. C. (2000). The role of transportation in the persuasiveness of public narratives. Journal of Personality and Social Psychology, 79, 401-421. Green, M. C., Strange, J. J. & Brock, T. C. (Eds.) (2002). Narrative impact: Social and cognitive foundations. Mahwah, NJ: Erlbaum. Harwell, C. W. (1980). Disordered personalities in literature. New York: Longman. Hock, R. R. (2002). Forty studies that changed psychology: Explorations into the history of psychological research (4th ed.). Upper Saddle River, NJ: Prentice-Hall. Hunt, M. (1993). The story of psychology. New York: Anchor Books. Kimble, G. A., Wertheimer, M., & White, C. L. (Eds.). (1991). Portraits of pioneeers in psychology. Hillsdale, NJ: Erlbaum. McKeachie, W.J. (1999). Teaching tips (10th ed.). Lexington, MA: D.C. Heath & Company. Meyer, R. G. (2003). Case studies in abnormal behavior (6th ed.). Boston: Allyn and Bacon. Polichak, J.W., & Gerrig, R.J. (2002). Get up and win: Participatory responses to narrative. In Green, M. C., Strange, J. J. & Brock, T. C. (Eds. ), Narrative impact: Social and cognitive foundations, (pp. 71-96). Mahwah, NJ: Erlbaum. Schank, R.C. (1990). Tell me a story. New York: Charles Scribner’s Sons. Schank, R. C., & Abelson, R. P. (1995). Knowledge and memory: The real story. In R. S. Wyer, Jr. (Ed. ), Advances in social cognition (Vol. VIII, pp. 1-85). Hillsdale, NJ: Erlbaum. Schwartz, S. (1986). Classic studies in psychology. Mountain View, CA: Mayfield Publishing. Shaara, M. (1974). The Killer Angels. New York: Ballentine Books. Such a good example of how the audience or the student is held in high esteem by the master teacher. The teacher expects that we have the ability to figure out the answer to our questions if given enough clues through our story telling. One of the lessons taught in law school is that you do not insult your audience by talking down to them. MELANIE C. GREEN is an assistant professor in the department of psychology at the University of Pennsylvania, where she teaches courses on social psychology, political psychology, and research methods. She received her PhD in 2000 from Ohio State University in social psychology. Her research examines the impact of narratives on individuals' beliefs.